No charter today so I took the opportunity to fish with Capt. Shane and his two sons, Will and Landon, on the Dreamweaver. 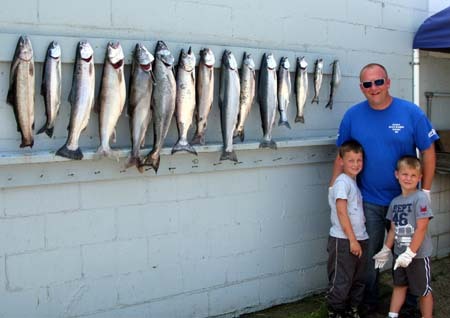 He wanted to make sure the boys got into some fish so we headed out to the temperature break northwest of Ludington. We set up north of the Point in 56 degree water and trolled wnw. We could see some fog in the distance and figured the big break was there, it was. The surface temp dropped from 56 degrees to 38.8 degrees in very short order . Our first bite was on a rigger set at 26 feet. After that all the action was on our Slide Divers and 1, 2, 3, & 5, color cores. 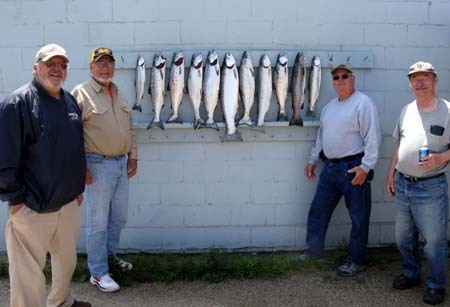 We caught a mixed bag of Steelhead, Kings, & Lake Trout. All our fish came on Super Slim spoons. 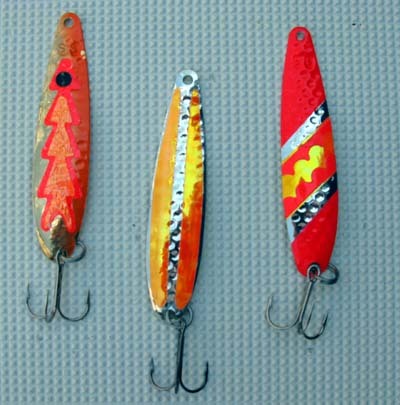 Our best were a Golden Orange Crush Icicle on a Slide diver with a 30′ lead out 90, and a Steelie Stomper out 85 with the same 30′ lead. We took several fish on a Double Orange Pearl on 3 & 5 color cores. Our best action was in the 48 to 43 degree water. When we finally called it quits were in 560 feet of water. The boys arms were sore but they were all smiles. We fished Southwest of Ludington today. It was tough not going back up north where we did so well yesterday. After seeing the 6/25/14 23:13 Coast Watch image for Ludington we decided the break we fished yesterday was pushed out of our reach. We ran straight out watching the surface temperature on our Fish Hawk . When it started to drop from 57.7 to 57.3 we shut down, put it on a 260 troll, and started fishing. 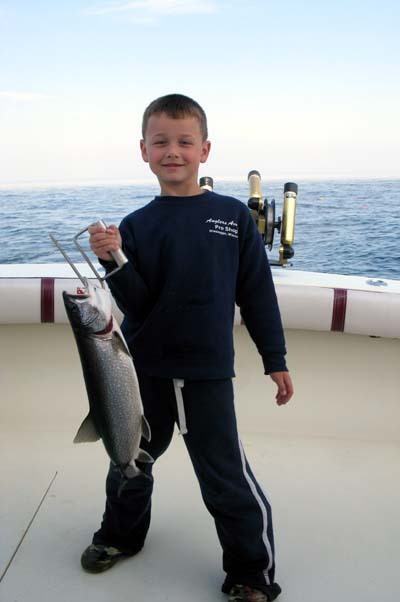 We only had a couple rods set when an out down set at 35 with a pair of Modified Fuzzy Bear Blue Dolphins took off. It was a big Steelhead that managed to get off after getting wrapped in the line after a nice jump. We had another tug on the same rod, but no hook up. We trolled quite a while before we got another bite. A King hit a Mag Dreamweaver Green Glow spoon stacked above a Tin Can Dodger on the chute rigger. That fish got off right behind the boat. We finally boated our first fish, a Steelhead, on a 3 color core with a Super Slim Starburst. We took another Steelhead later in the morning on the same setup. Fishing was slow. We kept trolling southwest hoping to find a sharp temp break. We trolled out to the 41 line west and never did find the break we were looking for. The temp just gradually dropped. We took a double when the temp dropped from 49.8 to 49.2. We decided to work that area over because from listening to the radio traffic it didn’t sound like there was much going on any place else. It paid off for us. We started the morning out running 3 meat rigs. We didn’t hit any fish on them early so we pulled 2 of them and only left 1 out. It was 10″ Mountain Dew Spin Doctor/Cold Steel Big Water Meat Rig out 120 on a low wire diver . We took 2 Kings on it later in the morning. We didn’t have a hot bait. We took fish on 3, 5, 7.5 and 10 color cores. No copper bites.